Kiefer Mendenhall ’62 was five years old when he started his first business. "I was a door-to-door pumpkin salesman!" Mendenhall laughs over the strains of opera music playing in his mountain home in Aspen, CO. 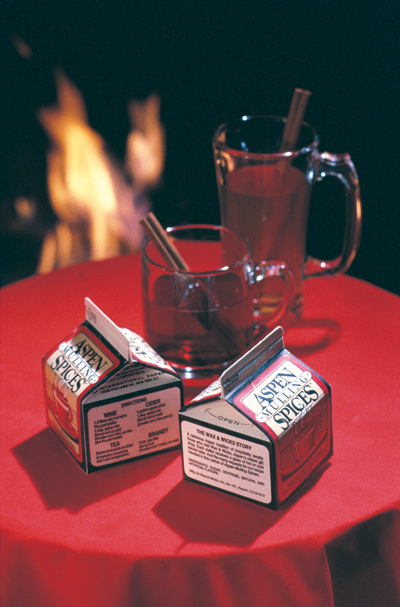 The man who transformed a hot drink he once served as hospitality in his gift shop into the Aspen Mulling Company—now selling Aspen Mulling Spices in specialty shops around the world and online—has been an entrepreneur most of his life. "People who remember me from kindergarten or grade school remember me as this little entrepreneur walking around the neighborhood doing a whole bunch of things trying to make money," Mendenhall says. He started by raising pumpkins at his grandfather’s farm in Danville, IN, and selling them in his Indianapolis neighborhood out of his red wagon. "My father and I would walk through the corn- field," Mendenhall recalls. "Dad would poke a hole between two stalks of corn, I’d drop a pumpkin seed in it and step on it with my foot." That seed grew into larger enterprises and a sense of self-sufficiency that has never left him. Mendenhall’s grandfather was a florist, and Kiefer often accompanied him to weddings and other events. The grade-schooler began to collect the partially burned down candles. He melted the wax, molded it in Campbell’s soup cans, and began selling rock steady, long-burning candles for use with the jack-o-lanterns. Then he began harvesting bittersweet from along the fencerows selling it as decorations for Halloween. "By the time I was 10 years old, I had $1,000 in the bank," he says. "I have been on the make, striving, a hustler, entrepreneurial—and all those things sort of fit when talking about being an entrepreneur—since I was five years old." He continued his entrepreneurial ways at Wabash, acquiring vending machines and placing them around campus until the College’s food service company complained to the Dean’s office and limited the enterprising student’s turf. But his creativity caught the eye of one classmate, who told him, "If you ever sell stock in Kiefer Mendenhall Incorporated, I want to buy some shares." So it’s not surprising that Mendenhall believes that much of what it takes to be an entrepreneur is "innate." "I saw this when I was more active in the Aspen Mulling Spices business, when I would go to Europe for trade shows," Mendenhall says. "You’d see guys at our booth there—maybe they were in a completely different business—standing a few feet back, not talking. I’d already given them something to drink, and they’d just sort of stare at the display. You could see it working in their brains—How can I make some money off of this?—and I don’t think that sort of impulse can be taught, at least in most cases. "Not all entrepreneurs are born entrepreneurs, but most have that in them." One quality of the entrepreneurial spirit Menden-hall describes is self-confidence. He had that in spades when he first moved his family to Colorado. He had graduated from law school and become a successful banker in Indianapolis. But a change at the top limited how high he could rise at the bank. So, in 1971, Men-denhall looked elsewhere. An admirer of musicians and artists—and their independent lifestyle—he lined up a job as an entertainment lawyer in New York City. But he was enticed when a banker he knew in Aspen called to tell him one of the better businesses in town was up for sale. Most would have chosen the safe route—the lifestyle he wanted with the security of a regular paycheck in the Big Apple. Kiefer and his wife, Mary chose the little shop in the mountains. "When I left banking and came out here, guys would say, ‘I wish I had the balls to do that.’ But Hal Hovey, one of the smarter of the smart people who came to Wabash, had this wonderful theory he called the Hovey Principle, or the ‘Wabash F-ck-It’ Syndrome," Mendenhall says. "Wabash men who had achieved very well in one career or industry would say, ‘F-ck it,’ turn to something in which they had no background, achieve in that, and would then do something else completely different again. And understand this was 50 years ago, when almost everyone expected to remain with the same employer or career path for life. Hal said there was something about the education, or about the type of guy who decides to go to Wabash, that gave them this ability to achieve and the confidence to try something completely different." Consider Mendenhall living proof of the Hovey Principle. He had no experience in retail. He hadn’t even seen the business when he bought it over the phone. "I had this confidence that I could do anything, baby," Mendenhall says. It was a confidence that was tested many times after the store was on its feet and he came up with the idea for Aspen Mulling Spices. "I had this idea of serving people something to drink to get them to browse longer. I created this product, and all of the sudden I was in the food business," Mendenhall says. The hours were ridiculously long, the course completely uncharted. "You develop something new and you believe in it, even when the whole world seems to be crashing down. I just wasn’t willing to give up. Part of the entrepreneurial spirit for me is that your success or failure equates with whether you’re a good person or a bad person. Your sense of self-worth is based on the business. "At trade shows I would turn to my kids and say, ‘Isn’t this stupid—a silly way to make a living.’ But I would also say to them, ‘Isn’t it interesting that intelligence can be applied to any situation or endeavor, even to a silly endeavor like this—that you can solve the puzzle.’"
Problem-solving is a strength of Mary Mendenhall, Kiefer’s wife and business partner, who brings balance to the equation. "Mary views everything as a problem with a small p—a puzzle to be solved," he says. "You have to be able to balance my willingness to take risks with her ability to be a problem-solver, and therefore be able to weigh the risks." Kiefer Mendenhall is a fiercely independent man. You hear it in his voice, his candor, and his abundant, sometimes self-effacing sense of humor. Even as a banker in Indianapolis in the 60s, he wore boots, let his hair grow over his collar. "Unless you have talent in entertainment or as an artist, the only thing you can do to achieve difference is to be successful to the point that you can sort of buy it," he says. "To me the best indication of success is that I can sort of break the rules and make my own." But Mendenhall doesn’t believe his life has much to teach Wabash students, and he quickly brushes aside any notion of his being a role model or mentor to would-be entrepreneurs. I was doing—without a business plan, with just a glimmer of an idea that had worked in a small store in Aspen. I would not recommend that anyone do it the way I did it. You would do them more harm than good." And he may be right. The best artists don’t always make the best teachers. They often choose the road not taken, the path few would or should follow. They’re not always the best mentors. But an inspiration. And that’s exactly what some Wabash students seeking their own place in the world will need.